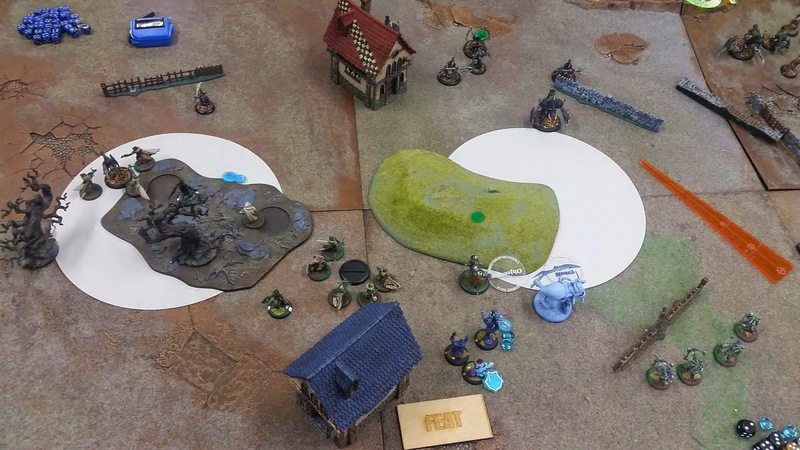 Retribution of Cyryst: Issyria vs Mortenebra tier, 35 points. Battle Report. Issyria vs Mortenebra tier, 35 points. Battle Report. This was a bit of a rematch. We had played almost identical lists against each other at the last Steamroller that I had won. This was a much closer game this time around. Issyria sets up behind the house. Strike force advance into the left zone behind the forest while the Stormfalls move to cover the distance inside the zone with their bows. The Banshee positions to give them fire support once the Jacks advance. Issyria puts Inviolable Resolve on the Strike Force more for the fearless buff than the armor. The opponent responds with careful positioning, trying to assess the threat ranges. The chaff runs forward to absorb some fire the extended control jack and a war witch head to the wide flank . I wasn't worried as the Strike Force should be able to deal with them. Not taking the bait I didn't feat, but contested the zones and cleared out the skirmishers. 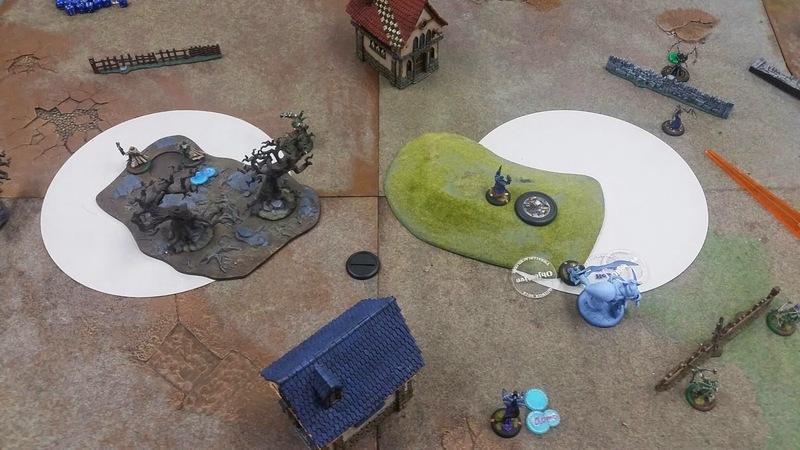 Admonition went down on the Banshee but I mis judged his advance and didn't toe him into the zone. 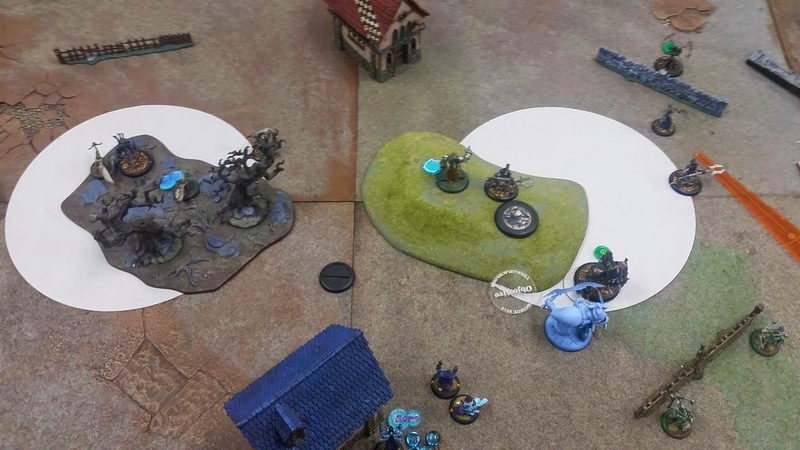 It was a fine bit of juggling to try and keep the Assassins into where I expected Issyrias control to extend to next turn, so they could deliver the charge. 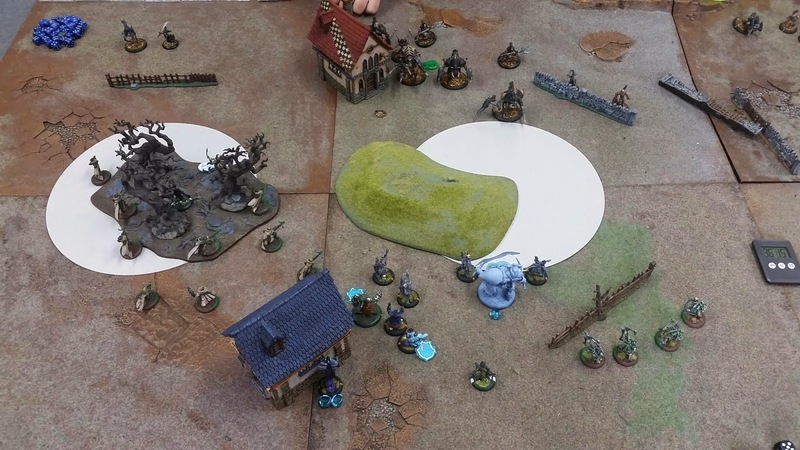 Stormfalls who didn't shoot at the skirmishers put some damage on the jack which was just inside the zone. I think they shot an arm off it. He feated and threw up all the buffs and committed. the jack that ended up in front of the Banshee, triggered moves off the stormfalls to let his other jacks get better range. This let me Admonition the Banshee into the zone to re contest however. 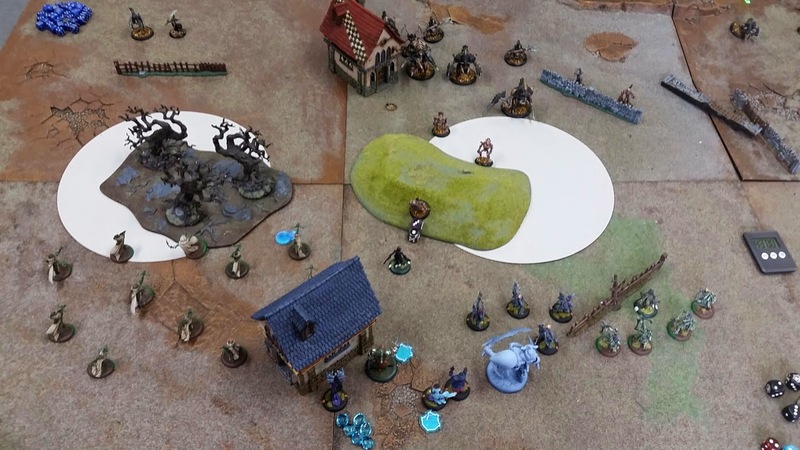 One unit of Stormfalls fell to Cryx warjacks and several Strike Force were killed by a Siren spray. The Hell diver popped up and killed another Strike force member. The armor buff didn't help but they didn't flee, which was a good thing. Upkeeps IR and floats to a central area trying to get the best position to deliver the feat. She feats and ancillary attacks the Banshee which puts a good chunk of damage on its adversary. She also loaded the Banshee up on Focus. 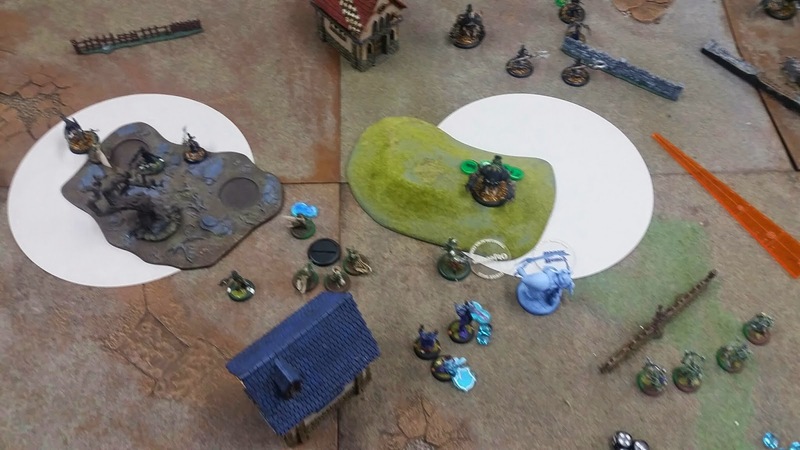 The Strike Force go and kill the Hell Diver and half kill the Stalker, the Assassin on that flank doesnt connect with and so doe not kill the Warwitch Siren. 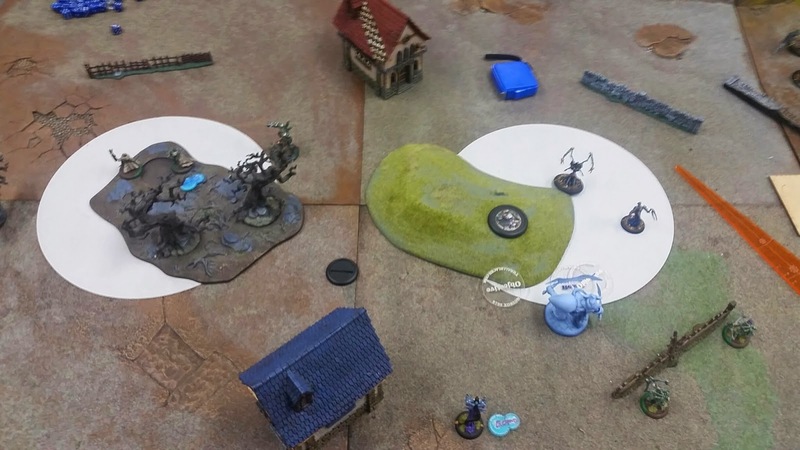 Aiyanna Kisses the closest jack, Holt shoots it for minimal damage then the Artificer charges it, doing some more damage and pushing it 2 inches closer to the Banshee. Now the Banshee goes, moves into a comfortable spot between both jacks and wrecks them both. 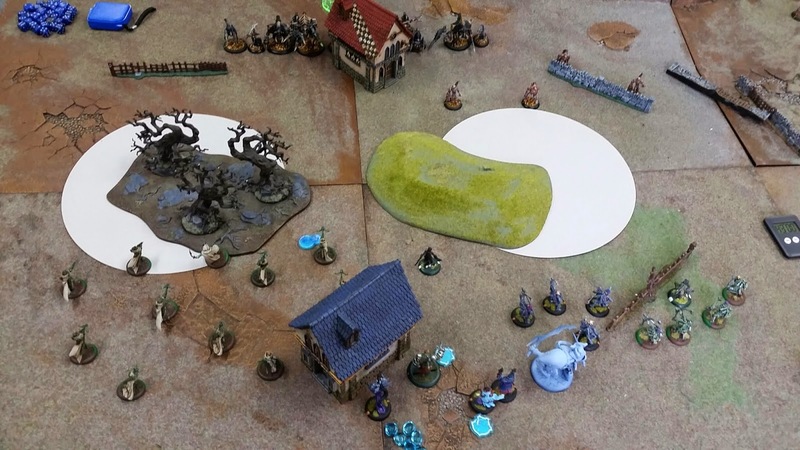 With a lack of good targets the Stormfall Archers on the right flank aim and pick off the War Witch Siren and a solo and put a little more damage on the far Jack. Both zones are still contested however and no points are scored. The warwitch Siren proves her worth and kills 4 or 5 Mage Hunters. The Stalker has lost an arm but still kills one Strike Force member. On the other flank my opponent makes an error in judgement and fails to deliver his jack. This was the error that cost the game. I think he could have concentrated on the flank with his Warwitch and Stalker. If he delivered the jack it would have been good perhaps, I don't know his chances of wrecking the Banshee. Regardless he was still very much in the game until a fully buffed and focused Jack stopped short on a hill in front of my guns. So yea the Banshee with a point of Focus aims and knocks down the jack, after which it is kissed by Aiyanna and the Stormfalls move up and wreck it. the mage Hunters who are still holding strong thanks to IR still fail to kill anything on the far zone, even the Assassin is still flailing about. A last ditch attempt is made to drop my Banshee and clear the zone. 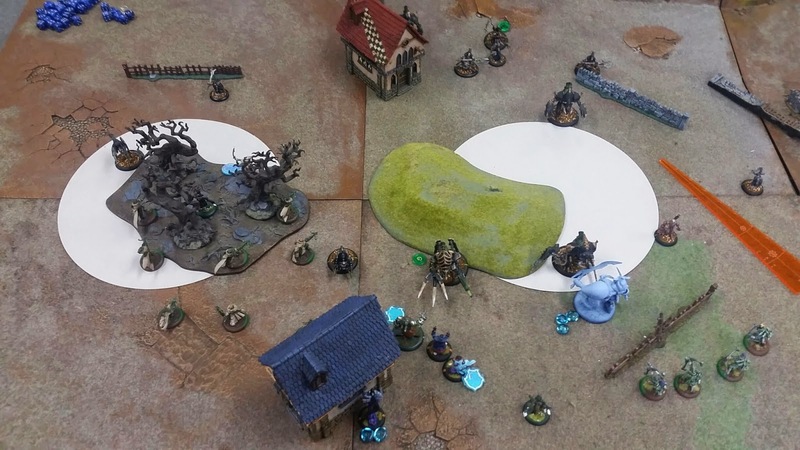 2 Stormfalls die and the Strike force take a few more casualties along with the Assassin to yet more Warwitch sprays. The Artificer and the Banshee stay in the zone however and he doesn't score. Finally the Strike Force clear off the left zone but they are now too weak to control it. The artificer siezes his opportunity and witht eh help of Crusaders Call charges into the rear of the Warwitch and shoes his meggma mittens where the sun doesn't shine. With more Focus the Banshee kills its new opponent and Aiyanna, Holt and the remaining Stormfalls clear out the rest of the right zone. 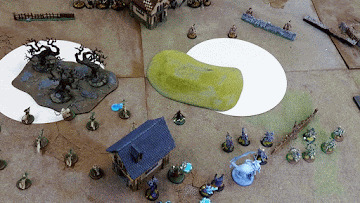 Valiantly, if Cryx can be valiant. 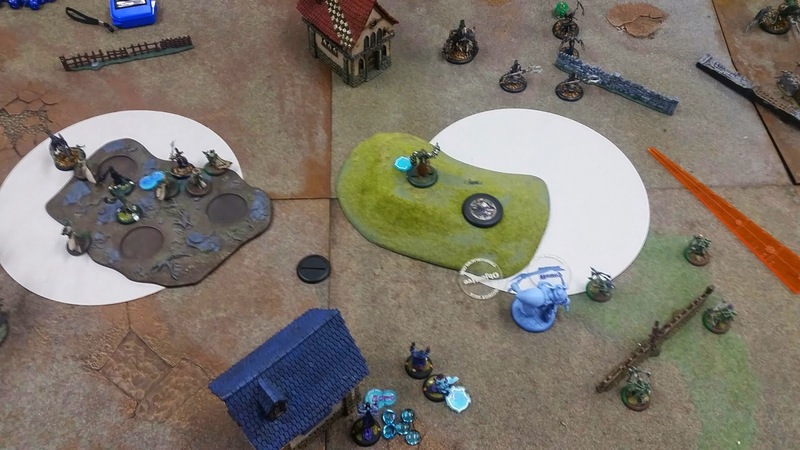 Mortenebra heads into the zone, tries to doom spiral the Banshee to death and chillaxes. At this point I could have killed her or simply walked my Artificer into the left zone, killed the solo on the right and floated Issyria into the right zone. Which is what I did. retribution win on Scenario 5CP to 0. Nice, I haven't played in sooooo long. I should get the lads back into it at some stage. I still love the models they produce. Unfortunately its one of those games where if you don't keep up with it, it can really leave you behind.